It's not the most exciting tool on the market, but the Stereo Bar can help you master stereo mic positioning. Hard to angle once mounted. 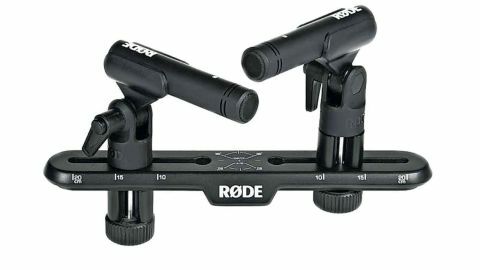 If you're planning on using coincident or near coincident mic techniques, Rode's new Stereo Bar should be on your shopping list. "It includes two mic clip retainers for use with any standard mic clips"
It includes two mic clip retainers for use with any standard mic clips, combined with two removable collars to allow various configurations, including positioning mics one above the other for XY configurations. Markings on the top of the bar clearly show angles for XY and ORTF set-ups, and ruler markings, including a specific ORTF position, assist with clip spacing by up to 20cm. The only thing missing is some kind of elbow for angling the whole outfit once it's loaded up and mounted on a mic stand.